of those designs that made me ask myself, "why didn't I think of that?!?!" I wish I had! 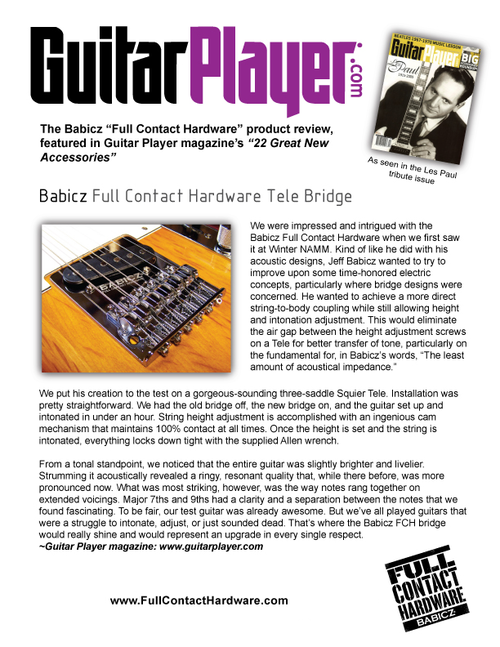 Today we are checking out Full Contact Hardware bridges by Babicz. 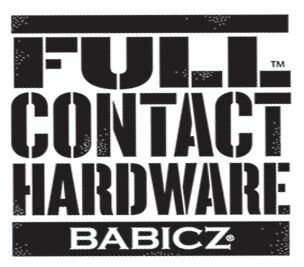 Full Contact: The name alone makes me think my Strat might check me into the wall as I make my way to the kitchen for my Cheerios. 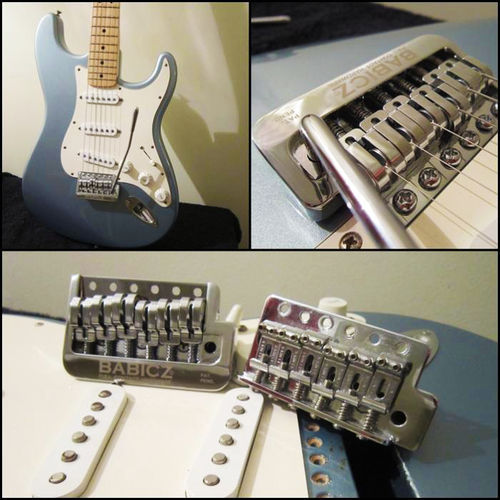 Babicz is a popular US guitar maker that also produces guitar and bass bridges. The standout feature on the Full Contact Hardware Stratocaster Tremolo is its eCAM saddle design. The average saddle on a Strat or Tele offers little contact with the bridge, besides the tiny height screws or the single intonation screw. The Full Contact Hardware’s saddles do exactly what you think they would; they beef up the saddle to where it sits directly on top of the bridge, making "full contact." Other features include a set screws on the bass side of the tremolo to clamp together the saddles for even more contact (The saddle height screws have been moved to the back for easier access). The intonation screws are left unchanged. Installation was a breeze. 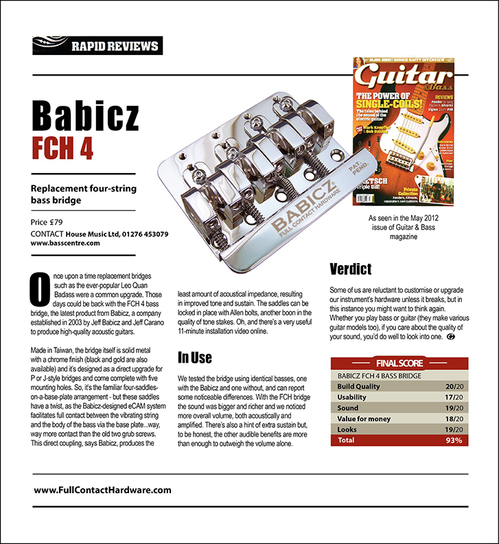 There were no new holes to drill, and the staff at Babicz was more than happy to double check with me and make sure I was getting the right bridge for my guitar, a 2002 Fender Standard Stratocaster. 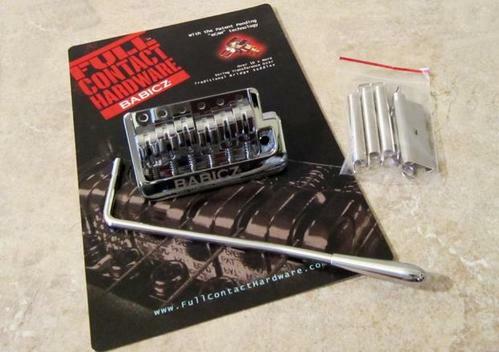 The FCH kit included a bridge, saddles, springs, a whammy bar, tremolo claw, instructions and plenty of screws. I chose to keep my stock tremolo claw so I wouldn’t have to re-solder the ground wire as well as replace the screws that mounted the claw to the body. To get a fair comparison, I used only three of the four springs Babicz sent, to match my Fender’s original setup. 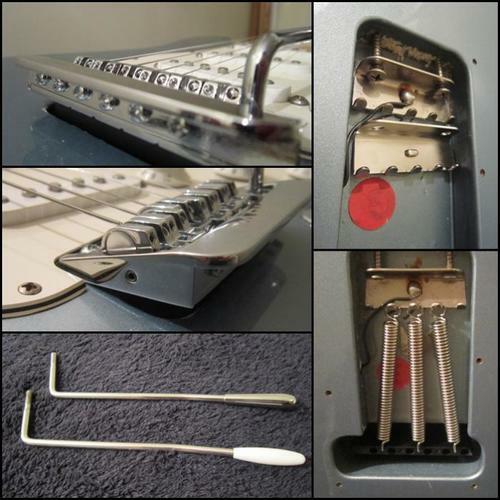 My method of installation kept the stock tremolo claw; all I needed to do was mount the six screws on the top of the guitar and attach three springs. This, a quick cleanup, new strings and intonation took me less than an hour. There was a standout difference in sound once I was finished. Sure, new strings always sound great, but my guitar nearly doubled in unplugged acoustic volume. More volume does mean added sustain. As far as the tone of my guitar, I didn’t notice a huge change; maybe the mid-range was a bit bolder, but I was satisfied with the guitar in the first place. The Babicz whammy bar is much stronger than my stock Fender. I’ve never broken one, but I’ve heard stories, and drilling out a broken tremolo arm sounds like a major headache. If you’re worried about cosmetics, my stock Fender did fit in the Babicz bridge, but I’d rather stick with theirs. I’ll probably never go all Scott Henderson with my tremolo, but the FCH offered a bit more stability, and I can comfortably go up and a down a major 2nd and return to my original pitch with ease. You can't believe everything you read on the Internet, but Billy Voight is a gear reviewer, bassist and guitarist from Pennsylvania. He has Hartke bass amps and Walden acoustic guitars to thank for supplying some of the finest gear on his musical journey. Need Billy's help in creating noise for your next project? Drop him a line at: thisguyonbass@gmail.com. Babicz Artist Jeff Berlin is considered by many to be the best electric bass player on the planet. His solos are amongst the greatest ever played on a bass guitar, and his harmonic and melodic approach to playing are legendary. Jeff Berlin uses the Babicz FCH-4 bass bridge, gold.